Well, this could easily be a compensation for the Musandam Dibba tour my dad had planned but couldn’t make it due to a delay in submitting Oman visa application. Sometimes more than the destination, the company plays a key role in determining how a trip would end. However, in this case, both the destination and the company played a crucial role. Khor Fakkan is a town located in Fujairah emirate in the United Arab Emirates. About 150 km from Dubai, it is one of the lesser visited getaways the country has to offer. 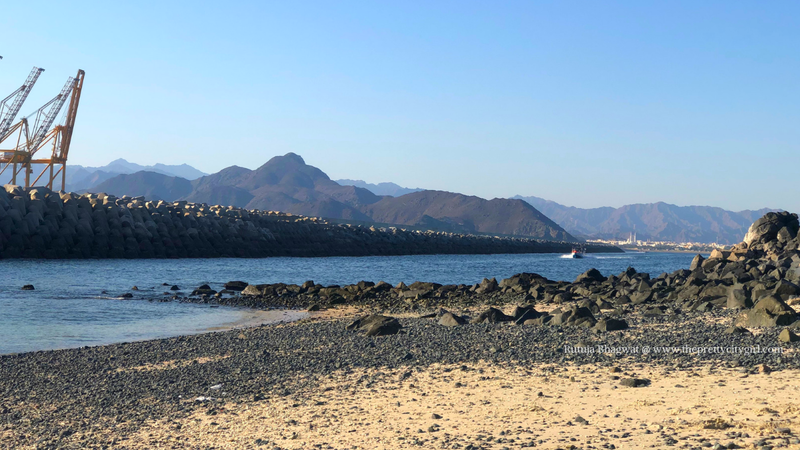 Khor Fakkan, much like its counterparts, is visited by many, so whether it is locals or the expats. However, it is yet to popularise amidst the tourists but by looking at the activities the beach has to offer, I wonder how long would it take. The fact that the beach has its own watersport activities, its own cruise ride, its own pristine coral island, and a 3 km shoreline, it seems the bright future is not very far. My dad has been living in Dubai for over two years and has stayed there in the past for many years now. Dubai–or Abu Dhabi for that matter–has one of the highest populations of Indians in the world. This country is, therefore, a favourable place for Indians as nobody is quite alone there. You are likely to stumble upon an old colleague or a schoolmate in one of the streets of Dubai. 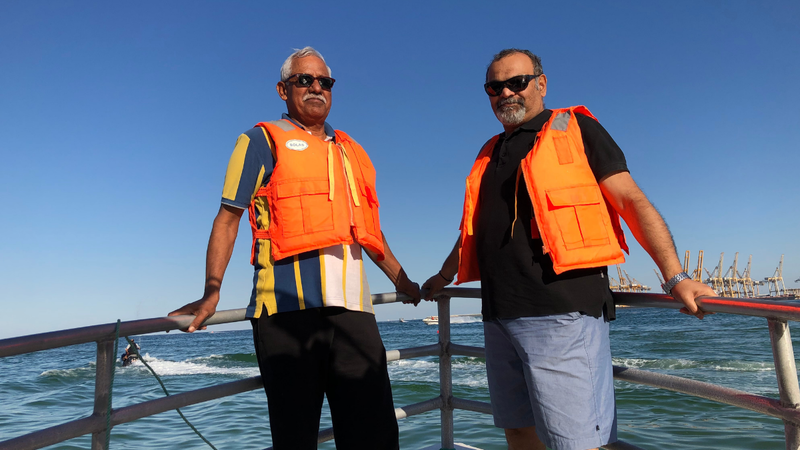 Similarly, out of the many people my dad knows, his erstwhile Indian Navy senior has become his close-knit. Every now and then, they plan a getaway to cherish old bonds and revisit their ship memories. 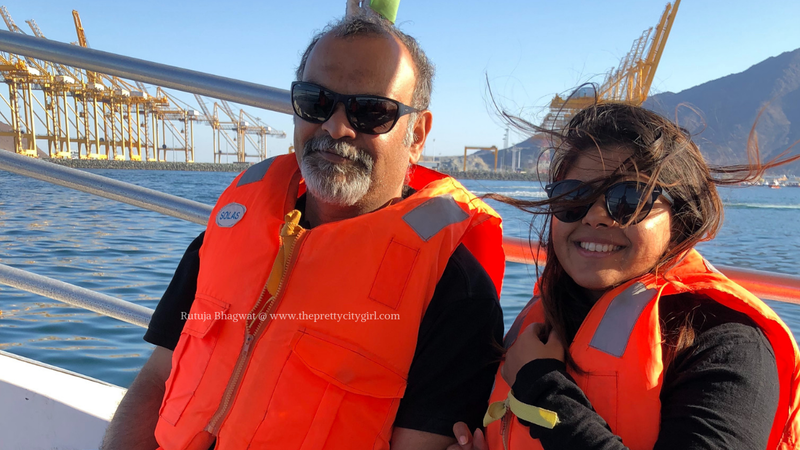 When I visited Dubai, the colleague and his wife planned a getaway with me. They planned on parasailing at Khor Fakkan. According to the plan, on a beautiful Saturday morning, my dad and I left for Sharjah in a bus. The couple has been staying in Sharjah for over five years and even has a driver’s licence and a car. Having a car arguably lets you explore places even public transport cannot reach. My dad and I hopped on a bus from the Al Ghubaiba bus station, which was the nearest to our house in Bur Dubai. There are frequent buses running from Dubai to Sharjah and you can get into one from this particular bus station. Other bus stops from where the bus to Sharjah from Dubai starts are Union Square and Al Satwa. After 15 minutes, we were already in Sharjah. On reaching, we met the uncle and he walked us home. This was the first time I was entering an apartment in the UAE. Though my dad lives in one, his place is a hotel apartment and not a typical residential apartment with a bedroom. My dad’s house is more like a studio. The kitchen, the living room, and the bedroom are all part of one big room. On entering the house, I could smell aloo parathas and it was a month since I’d had homemade parathas. I was craving for one. 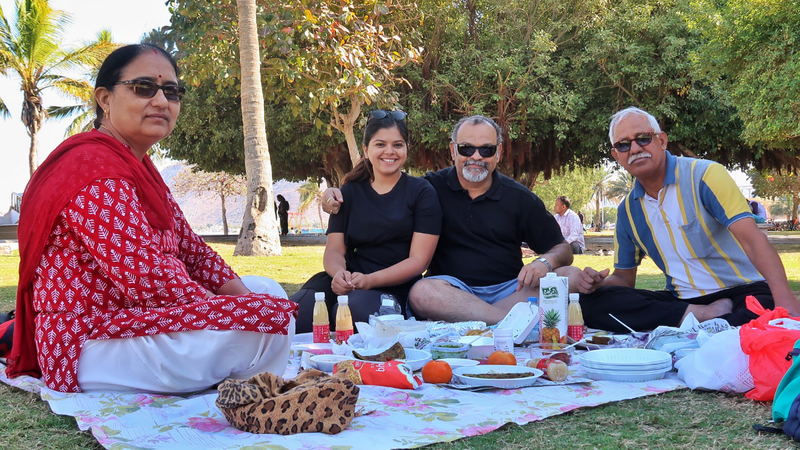 We had a light breakfast at their home and proceeded for Khor Fakkan. This was my first time sitting in a private car in the UAE where I knew the driver, unlike the private cabs. 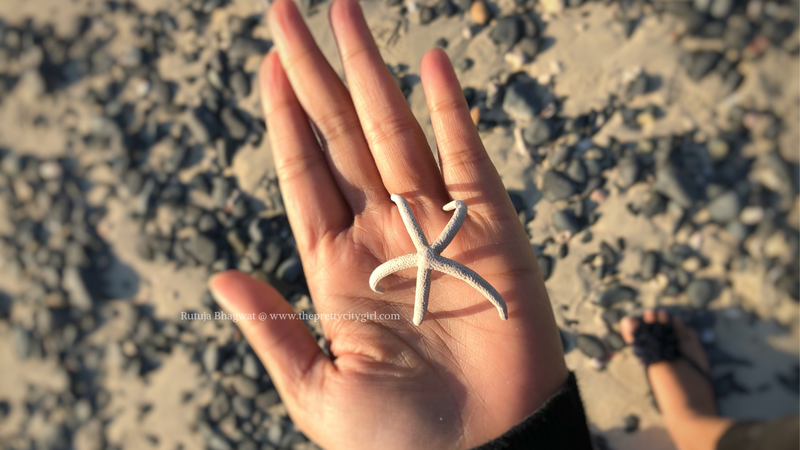 It took around two hours to reach the bay of Khor Fakkan. There is an ample space to park your vehicles, however, weekend evenings are populated so drive down early. You shall be greeted by locals who approach you for buying speed boat tickets to the Coral Island. Their negotiation starts right before you even step on the sand. There's a proper toilet and changing room facility available at the beach. One can either dine at the little cafes outlining the beach or picnic under the shady part of the sand. People even bring their barbeque grills and enjoy a nice time with family. 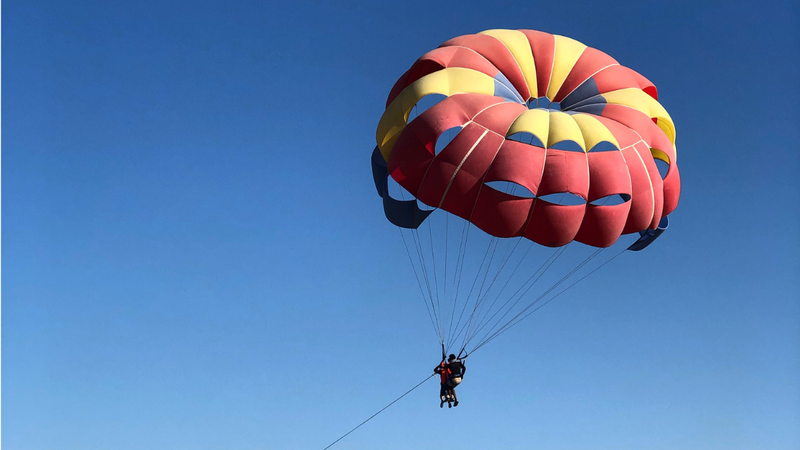 The parasailing costs AED 100 per person and two people along with the captain can fly at once. Meaning, if you're scared to go alone, you can tag your partner or a friend. You will come across the parasailing crew as soon as you reach the beach. There are about four to five parasailing teams. My dad and I parasailed together with the captain. I was not scared this time, maybe it was due to the past paragliding experience. The feeling sunk too soon as within no time the crew fixed us to the parachute and the boat started off. It was my dad's first-time in-air experience and he was hoo-ing and ha-ing. All this time, while enjoying the views, I only regretted not taking my phone up. I was still quiet as I knew the elderly couple was shooting us from down below and I would have some footage for my Khor Fakkan vlog. The views were breathtaking. The sea looked huge from the sky and I watched as our speed boat voyaged. I saw the trees on the shore, I took a glimpse of the horizon, and while I was engrossed, it was time to descend. Both the ascent and the descent went smooth, and I was sure that anybody could try this activity, irrespective of how less adventurous they are. I ran straightaway to the couple to see the footage. However, I realised that all the victory signs I showed to the camera went in vain. The couple failed to shoot even a single clip, forget a photo. Therefore, I was left with no evidence of parasailing. The couple, especially the aunty, was disappointed and begged me to fly again. She was ready to buy parasailing tickets for me and she pleaded me multiple times. I rejected the offer because I knew my dad won't let them pay and it just meant spending another AED 100 (Rs 2,000) for this. 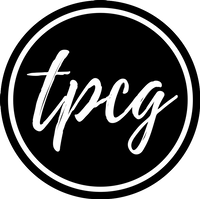 I thought of letting it go and though I was disheartened, I convinced myself that the experience was more important than the video footage. We found a nice shady spot for lunch and I was amazed looking at the picnic supplies the couple had carried. They spread a bedsheet on the grass and started taking out paper dishes, spoons, tissues, and newspapers from their bag. The aunty had cooked carrot pickle, potato-fenugreek parathas, and raita. We had carried dhoklas, banana chips, and peanut chikki from an Indian store. After lunch, we started for Coral Island. 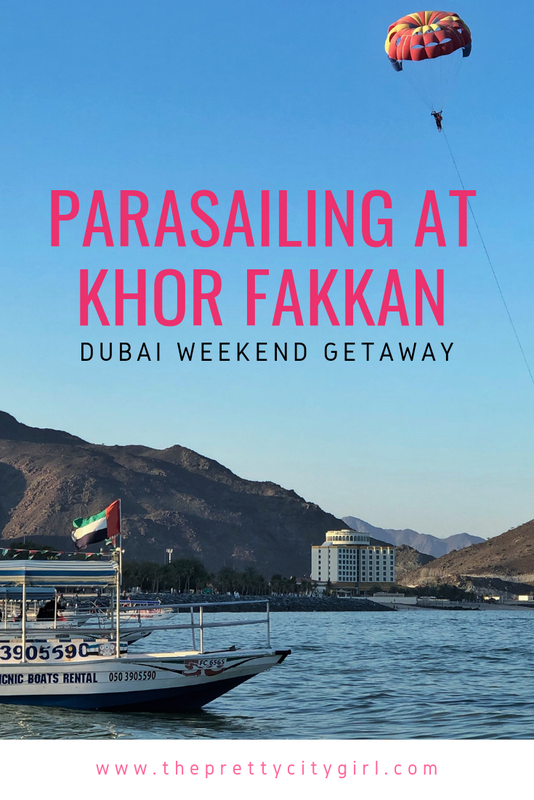 I never knew there was anything apart from parasailing at Khor Fakkan. We were there for this adventure only but thanks to the pushers who introduced us to the coral island. 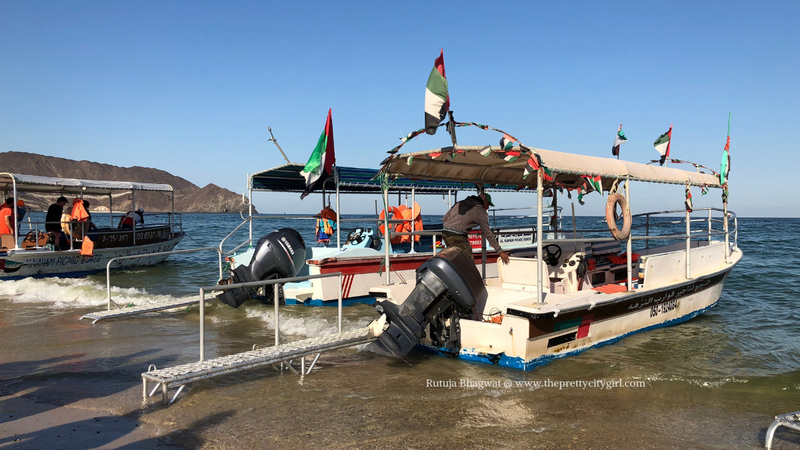 The charge per person was AED 20 and this included sailing to the island and immediately coming back. You can't even step out of the boat, forget swimming! The other package was AED 25 per person. The package additionally included a layover of 30 minutes. We chose the latter package because it was useless to just go on a boat ride. I wanted to get in the water and be amazed looking at its clarity. I never knew how corals looked like and these thoughts pushed me to pursue this island. There are multiple speed boats available, however, the boatsmen wait until the boat is fully occupied. This means that if you are in a rush, you will have to sit in a boat sooner and hope it gets filled up quicker. The ride from the beach to the island is a rough 10 minutes one-way and you come across a port, a construction site, mountains, and frequent splashes of water! You shall enjoy the ride for sure. The water at the coral island was the clearest natural water I had ever seen. Not one speck of dirt. The island, however, was covered with filth. The island is tiny but taking an action camera inside the water is something you must include in your Khor Fakkan checklist. I came across dried up starfishes along with dried up corals. I had never seen anything like it before. I was stunned. 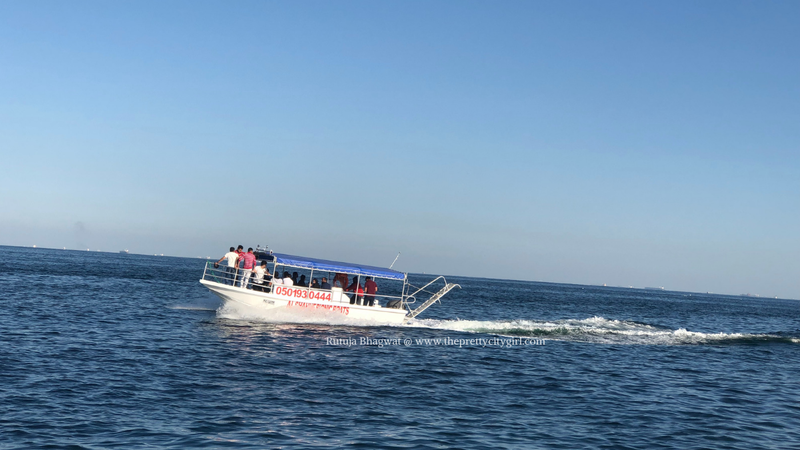 We collected shells, corals, and starfishes, and when we were at it, the speed boat returned. The speed boats only moved when there were enough people inside. So as soon as the boat filled at the beach, they sent it here to pick us up. 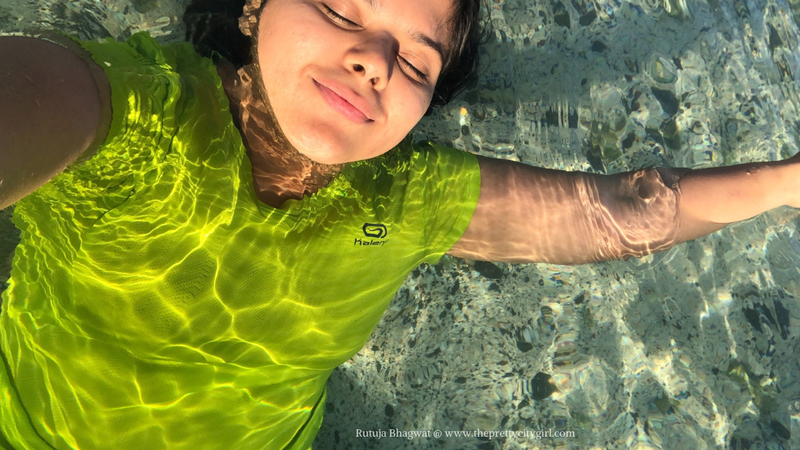 This half-hour time at world's one of the clearest waters made me want to explore more of such islands in future! Get down at Dubai Union Square (lies on the Red Line) and from there, catch a bus no. E700 for Fujairah. 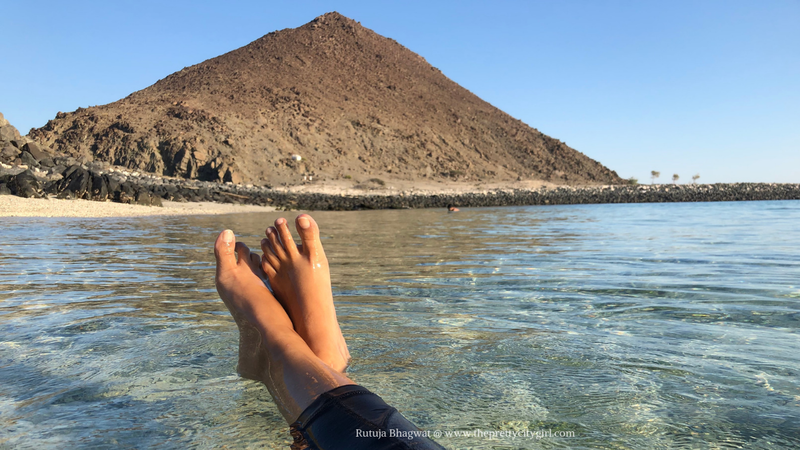 From Fujairah, hire a cab and ride till the Khor Fakkan beach. If you plan on taking a cab from Dubai, then the cost will be around 300 AED one way. So it is advisable to either follow the route mentioned above or go through a tour agent or look for a friend/family who has a car and a licence to drive. 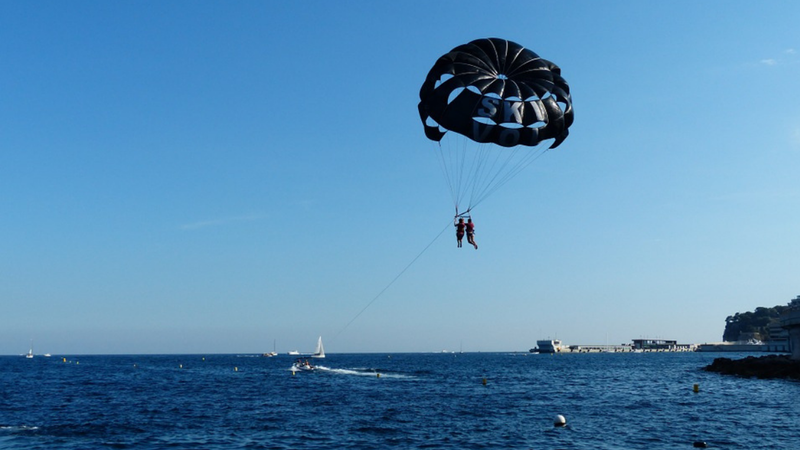 Khor Fakkan also offers other watersport activities such as jet ski and scuba diving along with parasailing. Carry an action camera to capture your moments while parasailing at Khor Fakkan and swimming at the coral island. Avoid wearing a bikini as I personally did not see any woman wearing one. The crowd consisted of more locals than tourists. Restrooms and changing rooms are available at the beach. It is advisable to reach early on weekends to score a parking slot or a shady patch on the shore.